Ulead Video Studio 9 requires 1.2 GB of available hard drive space for the program installation, plus the usual requirements such as a video card, soundcard, etc., not to mention the 4 GB+ hard drive space for video capture and editing. In fact, you can never have enough space for video capture, particularly if you want to capture in uncompressed mode. I usually capture MPEG-2 footage which is DVD compatible with a fairly high bit rate, resulting in about a gigabyte of hard disc space per hour. 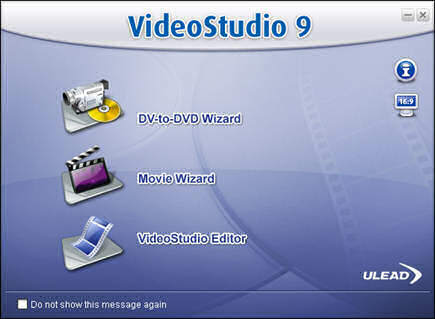 The program is split into three options on the start up screen, the DV-to-DVD Wizard, the Movie Wizard, and the main Video Studio Editor. The new DV-to-DVD Wizard does a scan (at 6x) of all the scenes on your DV tape and then lists them. You can then select the ones you want and click a button to burn them to a disc. Unfortunately I couldn't test this as I don't have a DV camera, and one wasn't supplied with the software for review! The Movie Wizard lets you add video and/or images and then apply one of the twelve templates (if it contains video, eight if it's just a slideshow). This adds music and titles in a particular style. You can then burn a disc, or edit the sequence in the Video Studio Editor. Some of these themes look very good, but you cannot edit the position of the text in the wizard mode. With the overlay it creates, sometimes your original video footage may be very small and drowned out by the background music, but you can chose not to have music. The auto panning and zoom works well with the slideshows, but if you choose the blank template you do not get any transitions. The Autumn theme worked well, but I found the superimposed leaves at the top and bottom of the screen got in the way of the slideshow. Once you open the sequence in the Editor you can remove the effects that you don't want, or you can create new ones for yourself. You can add mpa, mp3 or wav music files in the wizard, but once you start using the editor you can use the Smartsound music tracks. These are like midi files with real instruments, and apart from the variations that you can have, they can be adjusted to be any length. Normal if you used an mp3 file and it wasn't long enough, it would loop, with a noticeable gap, but the Smartsound Technology lets you create an infinite variety of unique royalty-free tunes to perfectly fit your video's mood and duration. There is also a built in music analysis engine that Ulead says detects rhythm patterns in the background music, enabling transitions to occur to the beat of the music. I found it difficult to edit the volume of the video footage using the editor, and had to refer to the manual several times. There are some programs that I have never needed to look up how to do something, but this isn't one of them. Clicking on the timeline until your cursor changes to a small arrow and then clicking a point and dragging it can lead to mistakes. You can set a default transition to use when adding clips, but there is no automatic cross fade of video and audio, like Sony Vegas. Even though there is a fade to black transition, you can't use it at the end of your video. Instead, you have to fade to a colour, and add a black solid colour. Titling has its own set of effects, which doesn't include a fade out. You can fade in your text, or make it appear with a zoom or a scroll, but you can only have the text disappear abruptly. You can design your own style of text and add it to the library, so you can then drag it onto the timeline every time you want that particular style. 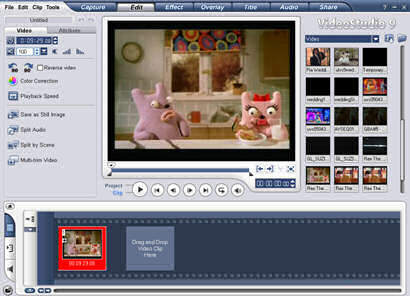 Several video effects have been added, like Pan and Zoom (which is used with the slideshows, but can also work with video), Strobe Motion Filter (speeds up or slows down portions of a video clip) and Ghost Motion Filter (creates a ghosting effect that is great for making kids' ghost movies). Some effects like Time Stretch, which lets you tweak the duration of video or audio clips to match other material on the timeline, without adversely affecting the audio pitch or Reverse Playback are fun, but are something that I would not use often. Chroma Key Editing lets you superimpose one video on top of another, removing the background, like the weather reports and early TV effects. You don't get a cloth to hang up for when you want to create your video, and I didn't have anything suitable as a substitute, so I couldn't really test this feature. It worked with the sample footage given, but this is to be expected. Flash Animation Overlay Support allows you to use Flash objects or clips that have been saved with a transparency channel, as cartoon-style overlays. 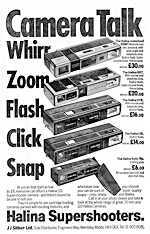 Flash animation support means users can place Flash (.swf) files as overlays simply via a drag-and-drop action to the overlay track. This would mean an easy way to convert flash to video by dragging a file onto the timeline if the audio track were imported as well, but it isn't. Auto colour correction can be added, but it cannot cope when a scene fades to black. It also lacks image stabilization to steady shaky video (a feature present in Pinnacle's offering). Ripple Editing makes removing portions of clips and arranging scenes easier, as it automatically adjusts the positions of elements like audio, titles and overlays in relation to the video. You can automatically split your video into scenes, but it may make too many breaks. Splitting the video footage on the timeline is just a click away, but with a problem. I was working on a wedding video and had joined four video files together. I then split the footage to get rid of the shots I didn't want. I added the fades between the scenes, but then I found I need to split the scene, as I had missed some scenes I didn't want. 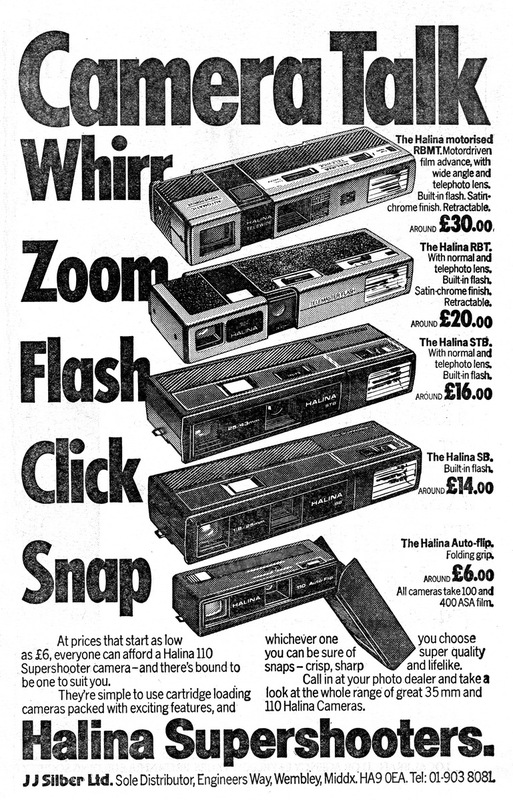 Bear in mind that this was from an analogue capture of a VHS tape, and not DV footage. When I split the scene, the transition at the beginning of the scene was lost, and I had to add it again. I don't know why splitting the scene is so destructive, as other program I have used keep the effects in the timeline, and just split the video into two. Some new audio filters include Volume Levelling to normalise the volume of loud and soft video clips and Audio Reverb to add a sense of acoustic space to their movies audio. Video Studio 9 also has a useful new tool that creates duplicate audio channels. This is ideal for users who've recorded single-channel audio on their video and want to create left and right audio channels, helping them achieve a true stereo sound, but unless you have really old video footage, then this isn't going to be used much. If you create a DVD from your edited video and set a particular menu style, this is saved in your project. I didn't realise this, as I opened the project in the editor, but as soon as I went to the DVD menu builder, my settings were still there. Another interesting feature is that you can insert your projects into the timeline direct. For example, I had created the beginning titles and save that as one project, and then created the main footage in another project. If I was using any other software, I would have to have rendered the titles and added it as a video file to the main project, or vice versa, but with VideoStudio 9 I just inserted the saved project into the timeline. Creating your DVD you can use one of the 30 themes available. However, you can't move the text on your menus, and you can't use smartsound tracks for the background music. 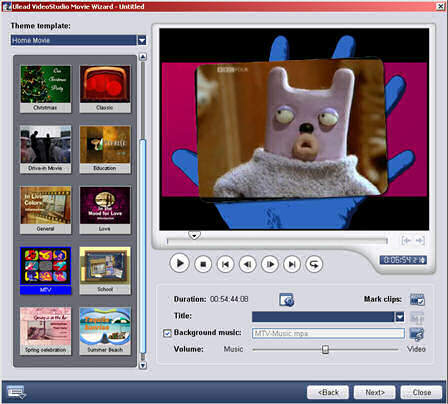 If you want to have more flexibility with you menus, you should use Ulead's DVD Workshop, which allow you customise nearly everything on your menus. There are no updates for the program on the website as yet, and no extras to download either (unless you count the DVD menus for the 2004 Olympics), but you should check the bonus CD as there are extra DVD menu templates, a must since the basic program is light on templates, and video tutorials. You'll also find video clips and image backgrounds. The quality of your final rendered video cannot be faulted, as it uses two-pass VBR MPEG-2 encoding to ensure the highest overall video quality. You can customise the bit rate, or output as AVI, RealMedia or wmv, in a variety of different settings. Rendering your video can take a while especially of you are resizing the footage. Thankfully, VideoStudio 9.0 is quick with the SmartRender feature, which only recodes the parts of the file you have made changes to. With a two hour wedding film I had created, it took Sony Vegas Video 5 over five hours to render the final mpeg file while VideoStudio 9 did it in just over two. Ulead have tried to combine everything you need to convert your video to burning onto DVD (although the program did let me burn a DVD to a CD, resulting in a disc that didn't work), but some of the features are not very flexible. The DVD menus are restrictive in their design, and the movie wizard doesn't offer enough choice. Editing your video is a little complex, but the end result is relatively quick and high quality.